CAUTO CRISTO, Cuba, Feb 11 2015 (IPS) - When it rains, trucks get stuck in the mud on the poor roads in this rural municipality in eastern Cuba. The local population needs more and better roads to improve their lives and help give a much-needed boost to the country’s farming industry. “When the roads are fixed, living conditions and opportunities will be bolstered in the lowlands, where most of our agricultural production is concentrated,” the deputy mayor of Cauto Cristo, Alberto López, told IPS. Most of the 21,000 inhabitants of this rural municipality, located on a broad plain prone to flooding during the May-October rainy season, are scattered around the countryside on individual or state-run farms or in farming cooperatives. The municipality also has a small urban centre and two people’s councils (organs of local government). The bad state of the roads in Cauto Cristo is just part of a nationwide problem that takes its toll on the country’s ageing vehicle fleet, poses a safety threat, and undermines communication on the island, especially between outlying areas and the cities where services like hospitals and businesses are concentrated. In rural areas, the deterioration of the roads compounds other factors, such as limited investment in agriculture and the shortage of labour power, all of which have stood in the way of the aim of boosting agricultural production, one of the priorities of the economic reforms introduced by the government of Raúl Castro. The economic crisis that has plagued Cuba for over 20 years has hindered ambitious plans for expanding and repairing the country’s network of roads, which currently includes 68,395 km of paved and unpaved roads. Of that total, 17,814 km are paved rural roads (including 655 km of freeway), 16,193 km are urban roads, and 34,387 km are dirt roads. Thanks to a 40 million dollar investment, state companies acquired machines to pave roads, four new asphalt plants were built, and specialised workers were trained, as part of a road expansion programme that should be completed in 2016. The project began by putting a priority on roads of national and provincial interest. Approximately 70 percent of the country’s road network falls under municipal authority, where and maintenance and expansion are the responsibility of local governments. “Local governments today enjoy greater openness and flexibility for resolving their most pressing problems, which in our case are roads and transportation,” said López, referring to the first decentralising measures of the current reforms, which have slightly expanded the reduced economic autonomy and decision-making power of the municipalities. Cauto Cristo, 730 km east of Havana, is a big producer of meat, dairy products and various crops. It consumes around 10 percent of the food it produces, and the rest is distributed to other areas of the province of Granma, where it is located. “Agriculture is our main activity because we have no industrial development,” the official pointed out. “Sometimes we send a truck to pick up the output and later we have to send two tractors to pull the truck out of the mud. That doubles or even triples the expense in fuel,” said Reinaldo Naranjo, president of the non-governmental National Association of Small Farmers (ANAP) in Cauto Cristo. 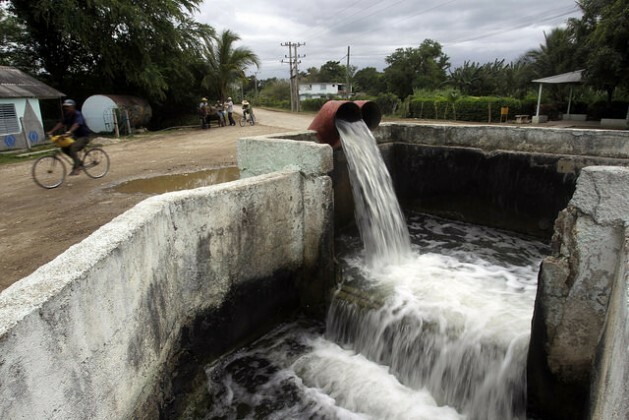 Of the 151 state companies that in 2014 suffered losses – a combined total of around 18 million dollars – in Cuba, 71 were managed by the Agriculture Ministry. Naranjo said that milk production is highest precisely during the rainy season, when the roads are impassable and it is difficult to pick up the milk from the farms. 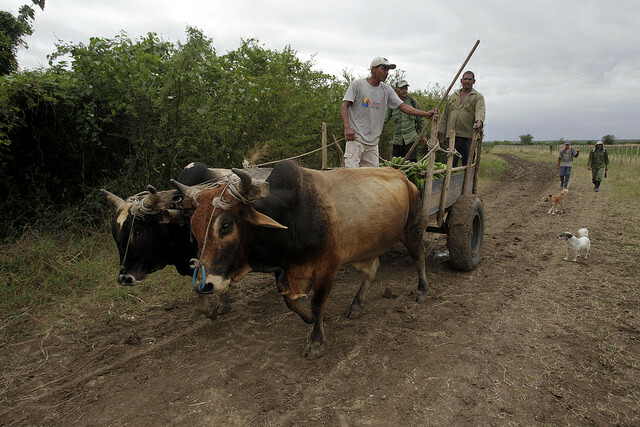 Milk is scarce in the Cuban diet and the agriculture sector has failed to increase production. From 2007 to 2013, the production of cow’s milk grew 21 percent. But this only represented 52 percent of what was produced in 1989, when demand was met by domestic production. However last year, Cauto Cristo managed to meet the planned volumes of milk, meat and tubers that are staples of the Cuban diet. Food production in Cuba must increase to meet internal demand and ease the unsustainable burden of food imports, expected to total 2.25 billion dollars this year. One illustration: the Empresa de Productos Lácteos Bayamo, a state dairy company – Granma’s flagship company and the biggest of its kind in the country – is producing at one-quarter of capacity due to a lack of raw materials. “Our peak capacity is processing 80 million litres of milk a year, and we are taking in 20 million,” the director of the company, Rauel Medina, told IPS. The factory produces different kinds of milk, cheese, ice cream, yogurt and diet products, with a workforce of 1,810, 20 percent of whom are women. The poor state of the roads is also affecting agricultural production in the municipality of Jesús Menéndez, in the neighbouring province of Las Tunas. “When it rained and it was impossible to reach the most isolated farms and cooperatives, the milk would go sour,” said Nilian Rodríguez, vice president of the local government. “The temporary solution that we are applying is placing electric dairy refrigeration units on the farms to make it possible to pick up the milk every two days,” he told IPS. More and better roads and transportation would improve the quality of life in communities in the countryside, where there is untapped agricultural potential: of the country’s 6.34 million hectares of arable land, 1.46 million are lying fallow. In late November, the ANAP branch in Cauto Cristo had 1,976 members, Naranjo told IPS – more than double the 898 members registered in 2008, the year the authorities began to distribute idle land in usufruct to those interested in working it. These and other problems prompted Daniel Soto, a 48-year-old farmer, to swap the land he inherited from his father, 18 km away, twice for land closer to his home in town. “Now I pay more attention to the land and I’m reaping better economic benefits,” said Soto, who likes to innovate when it comes to farming. With his hands, he made a smaller plow, pulled by a single ox, to obtain better yields.